John Smith Thach was born on 19 April 1905 in Pine Bluff, AR. He graduated from the U.S. Naval Academy in 1927 and spent two years serving in battleships before training as a naval aviator in 1929. Thach spent the next decade serving as a test pilot and instructor and establishing a reputation as an expert in aerial gunnery. In the early 1940s, he was placed in command of Fighting Squadron Three (VF-3). There he met a young Naval Reserve Ensign just out of flight school, Edward O'Hare, later a Medal of Honor recipient. Thach made O'Hare his wingman and taught him everything he knew. At the U.S. Navy fleet gunnery competition at the end of 1940, eight of the 16 VF-3 pilots qualified for the gunnery "E" award ("excellence"). Later Thach developed a fighter combat tactic known as the Thach Weave. This tactic enabled American fighter aircraft to hold their own against the superior Mitsubishi A6M Zero, the primary fighter of Japan. Lieutenant Commander Thach and Fighting Squadron Three flew from USS Lexington (CV-2) in the early part of World War II, and was assigned to USS Yorktown (CV-5) during the Battle of Midway in June 1942. On the morning of 4 June 1942, Thach led a six-plane sortie from VF-3, escorting a strike from Yorktown, when they discovered the main Japanese carrier fleet. They were immediately attacked by 15 to 20 Japanese fighters. Thach decided to use his namesake maneuver, marking its first combat usage. Although outnumbered and outmaneuvered, Thach managed to shoot down three Zeros and a wingman accounted for another, at the cost of one Wildcat. 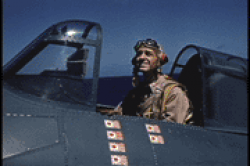 At Midway Thach was assigned to instruct other pilots in combat tactics. The U.S. Navy pulled its best combat pilots out of action to train newer pilots, while the Japanese kept their best pilots in combat. 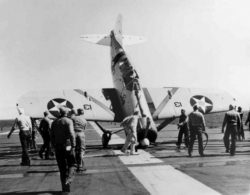 As the war progressed, the Japanese Navy lost their experienced pilots due to attrition and had no well trained replacements, while the U.S. was able to improve the general fighting ability of their own personnel. When the Japanese resorted to the feared Kamikaze suicide attacks, Thach developed the "big blue blanket" system to provide an adequate defense. Later in the war, Commander Thach became Operations Officer to Vice Admiral John S. McCain, Sr., Commander of the Fast Carrier Task Force. Thach was present at the formal Japanese Surrender on 2 September 1945 in Tokyo Bay. Thach is credited with shooting down six enemy aircraft during World War II. Thach commanded USS Sicily (CVE-118) during the Korean War and USS Franklin D. Roosevelt (CVA-42) in 1953-54. He was promoted to Rear Admiral in 1955. In 1958 and 1959, Thach was placed in command of an anti-submarine development unit, "Task Group Alpha," with USS Valley Forge (CVS-45) serving as his flagship. He subsequently appeared on the cover of Time magazine on 1 September 1958 for his contributions to anti-submarine warfare (ASW), which was a primary focus at the time in the ongoing Cold War. An annual award was later established in his name for presentation to the top ASW squadron in the Navy. He was promoted to Vice Admiral in 1960 and served as the Deputy Chief of Naval Operations for Air in the Pentagon where he presided over development of the A-7 Corsair II among other Naval Aviation programs. 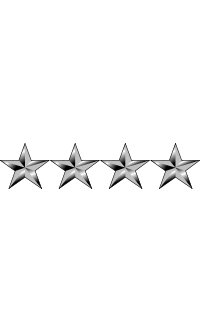 On 25 March 1965, Thach was promoted to the four-star rank of Admiral and assigned as Commander-in-Chief, U.S. Naval Forces Europe (CINCUSNAVEUR). 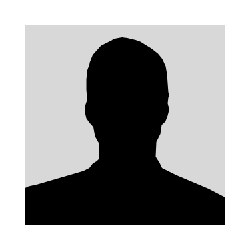 He retired from the Navy in May 1967 from that command. The frigate Thach (FFG-43) was named in his honor. John Thach and his wife, Dora Madalyn Jones Thach, had four children. 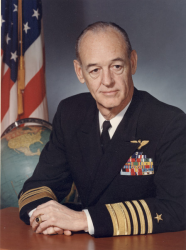 Admiral John Smith Thach died on 15 April 1981, in Coronado, CA, a few days before his 76th birthday. He is buried at Fort Rosecrans National Cemetery in San Diego, CA. Lt. Cmdr. Thach with kill markings on his F4F. Lt. John S. Thach tipped this F2A-1 onto its nose on Saratoga (CV-3) in March 1940.